The Guayaquil Ecuador Temple is the 58th operating temple of The Church of Jesus Christ of Latter-day Saints. In 1982, President Spencer W. Kimball, then President of the Mormon Church, announced that there would be a Mormon temple built in Ecuador. However, it took fourteen years to secure the necessary government authorizations and the temple was not completed and dedicated until 1999. Before the Mormon Temple was dedicated, an open house was free to all in the community, including government officials. Over one hundred thousand members and non-members came to support the arrival of the Mormon temple in their country. 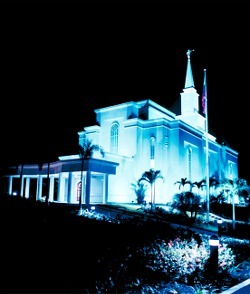 The Ecuador Temple sits on a quiet peaceful section of northern Guayaquil, Ecuador's largest city. Fertile volcanic soil and bounteous rain create a perfect setting for the landscape of this beautiful temple, which has been described by many as, "the most beautiful building in Ecuador." The Guayaquil Ecuador Temple has a total of 70,884 square feet, four ordinance rooms, and three sealing rooms. This page was last edited on 8 December 2010, at 17:03.